This bow is insanely great! Folks, after I Robin Hooded an arrow with the Hoyt, I put it down, in disgust, and I took out the Bear TD, a few weeks ahead of my shoulder rehab schedule. Shooting in the dark, with the bow of Sagittarius looking over me in the southern sky, I was blown away with my new Bear! It's insanely great! It's smoking fast, and I've never shot a bow this whisper quiet! I was thinking, it must be the fast flight string and puff balls, but Crookedstix found out puff balls tend to slow bows down a little, and this bow is so fast, I could rocket launch a shaft down to Jamaica! The string is beautifully made but seems a little thick. However, I get great nock fit and just love the string. I've read Bear strings are over-built, and this one does look that way. I'm thinking the shooting qualities probably come from the new limbs. They don't look like Bear limbs. They are tapered like a Drake and have tips just like a Deathmaster. Anyway, I've never shot anything like them! The bow is dead on accurate, with zero shock or finger pinch. The grip got a little slippery as my hand began to sweat, but it stayed still in the hand. I'm going to continue shooting the bow, but I'll limit my shot count to 20 or less until I get used to it. It's 47 pounds. all bows are insanely fast ,quiet etc when you first get them, then after you have them for awhile you figure out that it shoots about the same as the last insanely fast and quiet bow you had:) Nice bow though. No. This one is different. This one is shockingly great! This is Vlad the Impaler! The smart money says the Jinkster will own it within two months. And now he's gonna be on JSOG's list also..there was only one Vlad (and it wasn't made by Fred). I hope he can afford Secret Service protection as rumor has it his self defense capabilities are marginally adequate against mortally wounded roadkill that's still floppin' and hasn't quite "given up the ghost" yet! Certain bows just absolutely fit certain people. Congrats Joe, I'm happy for ya. It's an all time classic. After a closer look at the picture I must say that is one fine looking case. Can’t see all of it because of the junk laying on it. I love Bear TDs, and the new two-tone ones like yours are darn good looking. Lost Mind and Jinkster have never experienced the thrill and joy of shooting a magnificent bow like my new Bear! I've had the wow factor shooting a bow before, but this one has the WOWWW! factor! Objectively the only reports i can find is that these shoot about 5-10 fps slower than some of the top bows on the market, but thats not the only important thing, and that still makes them faster than a lot of bows. I’ve just never met a maple core limb that i liked. I'm glad you are enjoying your new bow. I hope the shoulder holds up, it would be a shame to have a bow you really enjoy and not be able to use it. I'm ready to work out the details in the sale of your Drake. I need another. What's the poundage of it? That usually has something to do with speed. Frisky I put a rubber shur-grip on my A handle for hunting.The neck of the grip can get sweaty. If you like it as much as i like my 64 Kodiak i am happy for you.It is the only Bear bow i have left.good shooting and hunting. 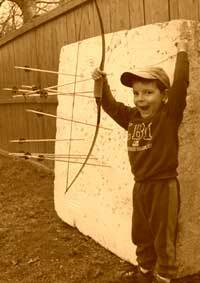 I love to hear from an archer that is excited and emotional about their bow whether it is fifty years old or brand new. Thanks for the buzz, Frisky. Hmmm, no target with arrows and bow showing........not even a string showing on this "insanely great" bow. Are you sure you did not just have a dream last night Joe????? I hope it's "you" Joe. Let the honeymoon wind down, find out what's she's like in the morning, and let 'er ride for awhile. I agree with the above post in regard to the new bow, and kinda temper my judgement till the newness is in the rear view mirror. When you find the bow for you, you'll know it. I'm unlike a lotta guys 'round here, in that they are presently holding more bows than I've ever owned. When I find "IT", I hang on. I now have twice the collection I normally hold...two. and both are "IT" for me. A 60" takedown recurve, 52# at my 29"...and an RD one piece longbow, 53# at same. From the same bowyer. Glad you like your “new” bow rather than that worn out wallhanger. I notice those limbs have a serious hook to them. More so than my 90’slimbs. More like my Rose Oak limbs. Now if we could convince Bear we need carbon/ wood limbs to get some real performance so a 40# bow would shoot as heavy an arrow as a 50# bow with 55# speed. Stikbow, he needs the compass just to get back to his car. Just kidding Joe, I am glad you got a good one, I bought a 1971 Bear Tamerlane and strung it up and had some aluminum arrows to match the poundage and after shooting ten or fifteen arrows through it I could put all of them in a three inch circle at 15 Yards, they definitely are good shooting bows. No bow is perfect. The secret is to find a bow that is perfect for you. Shoot straight Joe. There's now a perfect bow, and it's called the Bear Custom Kodiak TD! Let's put the 5 to 6 feet per second slower crap to rest. These new Bears have new limbs. They taper really narrow, like a Drake, have better tips, like a Deathmaster, and lots of hook without looking clunky like Jinkser's pile of garbage Border. You don't hear Jinkster talk about the border anymore, as the limbs probably blew! Vlad is going to do some serious impaling this fall! I have my own custom made bow saddle, for sweaty hand days and nights, but I'm holding off on it, preferring the uncovered beauty of this fine specimen! The Bear takedown is a good bow, I have had a couple, but they do not come even close to my JD Berrys or my Sunset Hill. I would wait before hose clamping a crown on that bow. Congratulations on getting the "Volkswagen of all Bows"!!! What does this mean to the Holy Grail of bows??? Really good looking riser for sure. I have the Ferrari of Bikes in my Colnago. Now, I have the Ferrari of Bows! Fast, sleek and beautiful running! I should have known the best bow wasn't going to come out of the West Coast! Those clunkers can't hold a candle to this new Bear. The Grail is the only great bow out of the West Coast. Even without a fast flight string, it almost equals the Bear. With a FF string, it's probably better. Even though it's only 2 pounds lighter than the Bear, it feels much easier pulling. I'm holding tight to it and might take deer number 4 with it, if the Bear bothers my shoulder. Your shoulder would prolly be just fine if it wasn't for all that stacking. I can't say a bad word against the Bear, since I've never shot one. Plus, after I helped grease the skids when Joe swapped his Deathmaster for the new Bear, he was thoughtful enough to send me a great gift--a Victorinox Swiss Army knife; their top-of-the-line "Farmer" model, which is now my constant pocket companion. So reluctantly, I must suspend any criticism of him and his new bow...at least until a decent period has elapsed. My next quest is to lure him and his bow to Colorado this fall for elk season! The Bear Custom Kodiak is as good as any bow made in that design, and it will perform just as well as any of like design. These guys like to tout their expensive, radical designs and that is all well and good. To compare those to a completely different design isn't sensible anyway. I'll take a Custom Kodiak if I only had one choice for a recurve to carry. So this bow is so good you'll be hunting away from the jersey barriers and in the big woods this fall? I been shooting one for around 35 years now. Glad you like it and its a fine looking bow. Glad you like the Bear and it is shooting well for you Frisky. Hope your shoulder fully heals up, and you are able to shoot it for years to come. George is quite sensible on this matter. One thing about the Bear TD is you never age out of it. Shoulders get bad, and I'll trade the limbs for 42 pounders. No problem. However, my particular limbs are likely the best Bear ever made, as they knew they were making them for me and didn't want to put out anything but the best of the best! Colnago? Another cheap secondhand import gadget, Frisky. You need to step up to a real bike like my Davidson! I will say the West Coast bikes were among the best of the best. I liked bikes from Davidson, Bruce Gordon and the CA made Masi. Dave Moulton made many of the Masi bikes in California. He also made my beautiful Fuso! However, it's hard to beat the ride of a Colnago. Ernesto knew what he was doing. Lately, I've been looking at the old Cinelli bikes, and they are about as flashy as they come. Was always a fan of the Colnago with the fancy paint and tubes, but liked a good old De Rosa better and the dream bike is the old orange Eddie Merckx the one that has his mug on the head and seat tube. Sure like the wood grain in that take down Frisky. Ehertz- A german on a new DeRosa (blue color) asked to ride my Colnago. I allowed it. He tried to trade for it, lol! It's a better bike than the DeRosa. I do like the orange (Molteni) Merckx though. Almost bought one. Bob- It does have a nice grain and coloration! I have Ritchey wheels on my Cannondale so I have some east and west coast going on. I've had the Cannondale since 1988 so it's earned its keep. Welcome to Bikes-R-Us, a traditional way to access your favorite hunting spot. I’ve never taken to a three piece t/d. I had one, so maybe I’ll try one again at some point. Your Bear look’s good, and I know enough people that swear by them. I read the HD is threatening to move to China, so much for supporting the wishes of those that support them. There were a bunch of RAGBRAI Colnago riders when they started here in town. There were two carbon models in my yard. I let them use my downstairs potty and shower. They left my arrow making stuff alone and the portable safe with my coin collection is still intact , but they did break my toilet float. Anyway, i couldn't ride the carbon bike, I found that my low back does not bend properly and end up crushing my fancy parts on that bizarre carbon seat. My situp bike with its low gear ratio and slightly fatter tires works better on the dirt tractor road than my Puch and is better for my low back. My bikes have the leather Brooks seats, I guess i am old fashion that way. I use it to tow my deer cart to access the middle of a large public tract. My Fuso and my Bear are alike, in that they're both insanely great! It's been well established in past threads that almost all of the best archers on this site are also bike enthusiasts, so a certain amount of overlap is inevitable. Despite living in Maine at sea level, those Colorado mountains in my upcoming elk hunt will be doable for me--thanks to the 4300 miles I have in on the bicycle already this year. Bikes and trad archery go nicely together. Yep. A bike can also be used to haul your deer out, in the unlikely event any of you will get one. Be honest! How many of you (preferably with examples/descriptions) actually dragged/hauled/carried/packed or however, got a deer out of the wood with a bicycle? I have one area that I hunt rarely, that I use a bike on. I bought a small trailer that I use to haul my stand in, and hopefully haul deer out on. I had a friend that put the seat up in the chest cavity, tied back feet up and front legs to the handle bars and walked it out a Forrest Service road. Seeing him in camp was hilarious..Still get a laugh out of it. Bet they didn't shoot those bicycle deer with an insanely great bow like Frisky's! Although it would be very handy to have all those interchangeable parts. Joe, remember to wear your helmet when you go deer hunting with your bicycle. You need to go really fast to knock a deer down with a bicycle. I have used my bike to go in, pulling my cart, but even in low gear could only peddle the loaded with a deer cart on the hard flat hard areas, on the soft areas and the uphill parts, I had to pull the cart with the bike flipped over on top of the deer. I know it sounds like I'm beating a dead horse, but I have to mention my shooting session I just completed tonight. Since the season opens September 15th, I took out the Bear TD and will only shoot that bow the rest of the way. What a bow! I moved the car back in the driveway, so I could shoot out to 19 yards. I'd start at 7 yards and move back to 19. Then start at 19 and move up to 7. It's 47 pounds, but draws a bit easier than my 45 pound Drake. My groups were not great, but I consistently shot 4 out of 6 arrows into a "one hand" pull. A 5th arrow had a wobbly flight, so I have to fletch it properly. I was just laying them in there, and this is only my 2nd night out with the bow this summer. I'll be more than ready to hunt! My worst groups ran 6", but I always had 4 in the bullseye and within an inch of each other. I just have to clean things up. The bow is fast and super quiet! No hand shock felt at all. I have to say it again- this is probably the finest bow I've ever shot! I expected a noisy, slow to average speed clunker, with a touch of hand shock, and I got just the opposite! I've shot MT's $2,000 Schafer Silvertip TD, and it's a good bow. However, it's over twice the price and is prettier but not as quiet and fast as the Bear. The Bear is a better bow. It's way better shooting than my Howatt Hunter. It's quieter than my Deathmaster. It's better shooting than my Grail. I hate to say it, but it shoots better than Fred's Mojo too. I'm glad Crookedstix got stuck with that dog! To think he called me a thief and brought a thug with him to get it back! It's way better than a 76' Grizzly I used to shoot. Better than a Pearson Silencer TD and a Herters too. I think it would blow the socks off a Widda. Frisky - are you going to shoot in the Labor Day Tournament? Shoot out to 19 yards? It gets really far now :-)) No wonder all your bows are fast, there will hardly be any difference in impact time between a slower and fast bow at that distance. Now shoot this at 40 or 50 yards and watch your trajectory with a heavy arrow and then you see what happens in comparison to other bows at this distance. Use your best bow and shoot this distance instinctively and then shoot another 3 or 4 arrows to have your brain adjust to that trajectory. Now use your next best bow and see where it shoots. For bow performance, the elevation of your hits are the most important as the arch is either steeper or flatter. A slower bow will loose elevation real fast beyond 40yards. I bet an old Red Wing Hunter with tiny tips with a beefed up loop FF String will easily out-shoot the Bear TD. That's a bet you could well lose, especially against the newer Bear limbs. I've owned several of both models and like the Red Wing but my experience is that Bears will keep up with them. "Frisky - are you going to shoot in the Labor Day Tournament?" I assume I'll be spending Labor day at the grill, grilling brats and pork loin and ribs. tecum- when you become more experienced at this sport, like Phil and me, you'll be able to assess speed differences at close range. For now, just take that Paul Bunyan of yours out and enjoy that dog at 40 yards! I'm sure a Bunyan is the fastest bow you've shot! On a more serious note, don't feel bad about shooting doggie bows when some of us have the new Bear TD. You can't always have the best like I have. Come on, Joe...shoot the Labor Day Shoot!! If you do, I'll shoot my MOAB or Widda...your choice! Nice! Good Job. I have never owned a take down (yet) But I want one. "Cool!...Somebody else must've bought a Covert Hunter!" but then I realize it's just tisky and his fake-down again! I knew old "Jealous Jinkster" would show up! Heck with how great your bow is,,,tell us how great of hunter you are..I know it's coming..
"I knew old "Jealous Jinkster" would show up!" What is there to be jealous of?...I already have a vast array of crow-bars, wonder-bars and pry bars and that'sa about all #1 TD limbs are good for! LOL! joe doesn't have a song written about him. I write music, it would be a challenge. Chicken or the egg, lyrics first? 'Joe Joe got a stinky big toe' 'Spent all his money a bow, none left to pay the wh"
Nope, can't do it, Joe will have to songless.